A black and white photograph of directors of the Whitby Rotary Club. 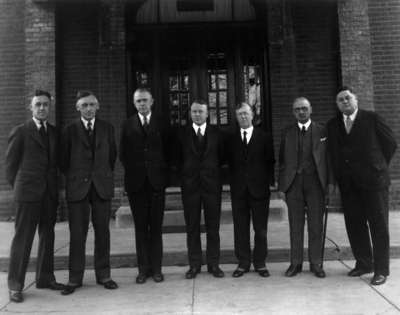 This photo was taken in front of the Whitby Hotel at 207 Dundas Street West where the Rotary Club had its first meetings. From left to right: Graydon Goodfellow; Arthur Allin (Treasurer); Dr. Graham MacDougall; Dr. George Stevenson (President); George Astley (Secretary); Albert Browning; Ed Bowman. Directors of Whitby Rotary Club, March 1933, Campbell Studio. Whitby Archives 18-020-003.